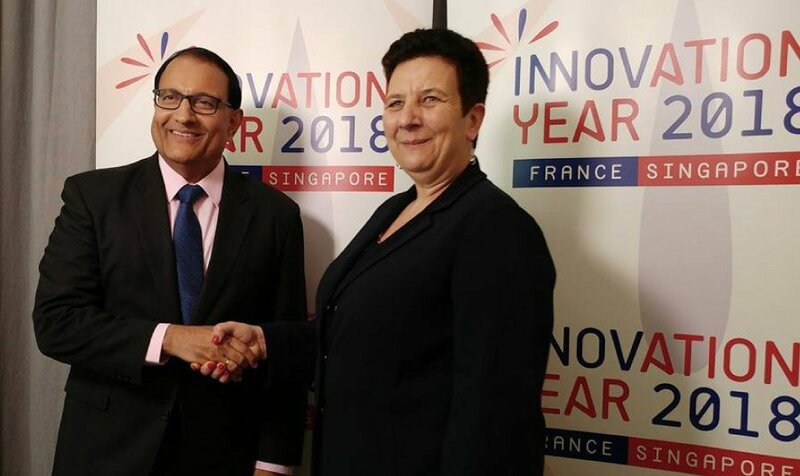 22 January 2018 – The France-Singapore Year of Innovation officially kicks-off this month with visiting French Minister for Higher Education, Research and Innovation, Frédérique Vidal, arriving in Singapore in a visit aimed at strengthening ties between both countries’ innovation ecosystems through research, science and start-up collaborations. Accompanied by chairmen of top French research institutes and universities as well as industry key players, Minister Vidal will deliver a speech at the Global Young Scientists Summit (GYSS), one of the Year of Innovation key events attended by young researchers and world-renowned scientists, including French Physics Nobel laureate Claude Cohen-Tannoudji. Minister Vidal will also meet with the Singapore Minister of Trade and Industry, S. Iswaran, Foreign Minister Vivian Balakrishnan, Senior Minister of State Janil Puthucheary, leading research institutions NRF and A*Star, and higher education institutes including the National University of Singapore and Nanyang Technological University to lay the groundwork for greater bilateral cooperation in innovation. Minister Vidal will officially launch the Year of Innovation during a roundtable with Senior Minister of State Puthucheary on 23 January at the National University of Singapore. The discussion, led by French and Singaporean key stakeholders, will focus on how to effectively make the transition from research to innovation. During her visit, Minister Vidal will witness the signing of several agreements reinforcing France and Singapore cooperation such as the renewal of joint labs (CINTRA, Majulab) and the scientific collaboration between French Technological Research Institute (IRT) SystemX and Nanyang Technological University (NTU) on the Autonomous Vehicle Simulation and Validation (ASV) project. Minister Vidal will also visit Impact Hub Singapore to learn more about one of the events in the year’s lineup – the collaboration between the Infocommunications Media Development Authority of Singapore, Numa, and Impact Hub, to bring the DataCity programme here. France aims to continue the development of joint French-Singaporean laboratories by enhancing existing collaborations and by helping other high-profile French research institutes to set-up partnerships in Singapore, among them are National Institute of Health and Medical Research (INSERM) in the field of chronic and infectious diseases and Institute for Research in Computer Science and Automation (INRIA) in particular in the area of Artificial Intelligence. Minister Vidal’s visit to Campus for Research Excellence And Technological Enterprise (CREATE), led by National Research Foundation (NRF), will hopefully pave the way for a future partnership with France’s National Center for Scientific Research (CNRS), Europe’s largest research organization. France is also supporting the French Alternative Energies and Atomic Energy Commission (CEA)’s joint project with Singapore’s National Environment Agency (NEA) and NTU on circular economy. Singapore and France agreed to designate 2018 as the Year of Innovation, recognising that innovation drives the transformation of Singapore and French economies and societies. Seeking to advance bilateral collaborations, both countries believe there are considerable synergies and complementarities that can be harnessed for mutual benefit and broader value. Key events hosted in Singapore and France throughout 2018 are being leveraged as platforms to showcase innovation, and highlight specific bilateral initiatives and collaboration.